If you are pregnant and have asthma, you may have many questions about using asthma medication in pregnancy. Look through the pregnancy FDA drug classifications: they are full of qualifiers such as "sometimes" safe or "may be" safe. Because most medications have not been adequately studied in pregnant women, health care providers encourage pregnant women to use as few prescription and over-the-counter medications as possible. When a pregnant woman has asthma, however, there are other factors to consider. The complicating factor in asthma treatment in pregnant women is the risk to mom and baby if asthma is under treated and becomes worse. The increased risks you and your baby are closely linked with the severity of your asthma. The more severe your asthma is, the greater your risk for having these complications. The good news is that if you are able to control your asthma, these risks decrease. Asthma severity often changes during pregnancy. About a third of women who have mild to moderate asthma when they become pregnant will have an increase in asthma symptoms. One in three women who have moderate to severe asthma when they become pregnant will see their asthma improve as their pregnancy progresses. Researchers haven't figured out why this happens, which means they can't predict who will get better and who will get worse. Because it's impossible to predict how your course of asthma will go, inform every health care provider with whom you interact during pregnancy, that you have asthma. This includes not only your doctor or nurse-midwife but also providers of prenatal testing and other supportive services. If you have been seeing a specialist for your asthma, you should continue your appointments but make sure your pregnancy care provider and asthma specialist are communicating. The safest way to treat asthma in pregnancy is to focus on what you can change in your environment and health. This will keep your asthma from getting worse. There is no one asthma medication you can take that is completely safe for use in pregnancy. However, some drugs have more risks than others. 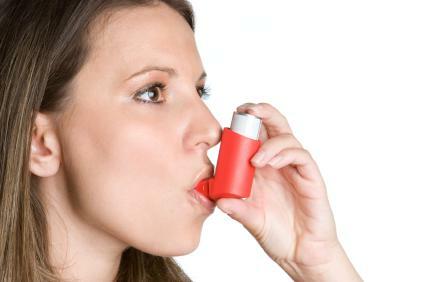 Inhaled bronchodilators are known as "rescue inhalers." The most common of these is an albuterol inhaler. Because they are only used as needed and the amount of medication used is small and goes directly into the lungs, inhaled bronchodilators are considered relatively safe for use in pregnancy. If you use your rescue inhaler more than once a week or more than a few nights a month, you should talk to your health provider about changing your asthma regimen. Inhaled corticosteroids are often the next line of asthma defense for pregnant women who are not getting appropriate control with just an inhaled bronchodialator. Again, because the amount of medication used is small and goes directly into the lungs, asthma specialists believe that the risk to the baby is smaller than with more systemic treatments, including oral medications. Most of the oral medications commonly used in asthma treatments have not been studied enough to be deemed safe for use in pregnant women. Some categories of medication, such as oral corticosteroids, may cause a slightly higher incidence of birth defects in the baby when used by pregnant women. All of the oral medications should be avoided during the first trimester if possible. If you are pregnant, have severe asthma and are not able to get your symptoms under control with a rescue or steroid inhaler, your doctor may suggest adding oral medications to your asthma regimen. If your situation warrants taking asthma medication in pregnancy, you'll need to work closely with your health care providers to keep you and your baby as safe as possible. It might seem complicated, but it can be simplified if you remember the primary overall consideration is safety. When you are making decisions about using asthma medications in pregnancy, you want to use as little medication as needed to maintain appropriate asthma control.